You can prevent the dangers of broken glass using one of the alternative materials, such as Safeglass®, for your break glass parts. 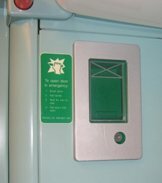 We were asked to design a new break glass part to cover the emergency door release (EDR) on a ScotRail train. For the break glass part, we chose to use Safeglass® because of its versatility and ability to overcome the problems associated with broken glass. The Safeglass® part was inserted into a much harder plastic part to provide additional strength where needed. ScotRail have been a client for many years and we supply them with a variety of parts for their entire fleet. One of their newer models, the Class 334 Junipers, had an emergency handle with no anti-tamper protection. ScotRail wished to install a piece of break glass over this handle to reduce accidental usage. We met with the engineers at the depot to view the location and size of the aperture and discuss how to move forward. The size and shape was not straight forward. Two materials are used together to make the cover for the aperture. One part consists of a non- Safeglass® material which is quite flexible. The Safeglass® part fits inside this part. The two materials compliment each other and fit seamlessly into the handle enclosure. There was some trial and error work required to ensure the Safeglass® part could be broken without obstructing the handle. Once a solution was agreed, the relevant conformance processes were carried out. The part was then rolled out throughout the Juniper fleet. The handle is now better protected.